It has been an interesting last few days for this particular blogger. What began as a thought-piece about how psychologists prescribing might bring needed balance to psychiatric practice became a lightning rod for rage, mockery, and often interesting debate. No threats yet, though I did get the following anonymous note in the mail today: "Carlat you (expletive) turn coat. Stick this in your (expletive expletive)." Civil discourse is alive and well in America. But beyond that enlightening comment, there have been several good forums of debate. There are currently 86 comments to my March 22 post, and they represent a reasonable cross section of opinions on the issue. Many argued that psychologists would put patients at medical risk because a two year masters is not good enough. Some believed that psychologists would end up doing exactly what most psychiatrists are doing--short med check visits in order to make money. My friend Ron Pies tried to bail me out by referring to the post as "one of the most effective satirical sketches since Jonathan Swift's famous (or infamous) "Modest Proposal" but later posted a thoughtful rebuttal which he later developed into this interesting editorial for Psychiatric Times. There's also a great forum on the Student Doctor Network. Entitled "Carlat and Overzealous Psychiatrists," there are now 78 comments. While every single person on that thread disagrees vehemently with me, I've enjoyed the back and forth because most of the writers are medical students or residents and seem to at least get a kick out of thinking this issue through. Ultimately, I think the most valid potential argument against psychologists prescribing is the safety issue. Even though they have been prescribing since 1995, it is hard to figure out how to judge whether they are prescribing safely or not. As I understand it, there are 50 medical psychologists in Louisiana, 25 in New Mexico, and 20 to 30 in the various branches of the military. But nobody seems to know exactly how many patients they have seen or how many prescriptions have been written. Eveybody agrees that the number of prescriptions is in the "thousands," but is it 20,000? 200,000? 500,000? Size does matter here, because the larger the denominator, the more meaningful it is that there have been no complaints about prescribing psychologists to any medical board or any military authority. I see my role, hopefully, as being an information broker between the psychologists and psychiatrists. I want to nail down some of the safety figures. I want to figure out what kind of safety surveillance would be adequate. There is so much animosity between the two organizations that it is nearly impossible to have a civil and rational conversation. I find that unfortunate, because the best psychiatric treatment is inegrative treatment, and the best way to achieve it is for the two professions to share information. Whether psychologists end up continuing to snap up states in their quest to prescribe or not, I hope that we can all agree that patient care is our number one priority. Squabbling amongst ourselves over turf is not helping anybody. In the latest issue of JAMA (the Journal of the American Medical Association), Dr. Thomas Insel, the chief of NIMH (National Institute of Mental Health) accuses academic medicine of having become a "culture of influence," in which drug industry marketing goals have pervaded the practice of psychiatry. Insel's commentary is entitled "Psychiatrists' Relationships with Pharmaceutical Companies: Part of the Problem or Part of the Solution?" While acknowledging (as we all should) that some collaboration between physicians and pharma is a good thing, he concludes that industry influence has radically skewed psychiatric practice in favor of the most expensive drugs, even when evidence shows that cheaper generics work as effectively. He also bemoans the fact that effective psychotherapeutic techniques are "woefully underused and frequently not reimbursed." "The focus on financial conflicts of interest in psychiatry is an opportunity to take the lead in setting new standards for interactions between all medical disciplines and industry. Academic leaders, professional societies, and patient advocacy groups could turn the tables of public trust by developing a culture of transparency for psychiatry's collaborations with industry, including the clear separation of academic-clinical missions from industry marketing." "Though Dr. Insel spoke in platitudes about the need for transparency as a solution, the spirit of transparency did not move him to disclose that Nemeroff is his former boss at Emory; that Nemeroff found a position for him when Insel was departing the intramural research program at NIMH; that Nemeroff lobbied for Insel’s appointment as NIMH Director; and that Insel appointed Nemeroff as an advisor soon after he moved to NIMH. These are pertinent conflicts of interest that readers of JAMA deserve to know about." If this is true, this is interesting information that is new to me. Nonetheless, in my opinion it does little to detract from the power (and courage) of the country's chief psychiatrist calling his own profession out on the carpet for bad behavior. Bravo to Dr. Insel! First, I apologize to readers of my blog for the paucity of posts lately. The reason has nothing to do with my health (I had a mitral valve repair surgery at the end of March and have recovered uneventfully). I’ve been too busy with a bunch of things, all of which are coming to fruition this May. 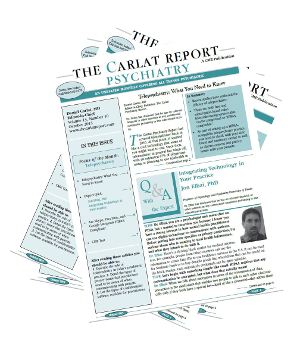 These includes a book called Unhinged: The Trouble with Psychiatry; an article to be published in the New York Times Magazine; launching a new newsletter called The Carlat Child Psychiatry Report, to be edited by Dr. Caroline Fisher; and new blog columns for both Psychiatric Times and Psychology Today. So I won’t be able to keep up the twice weekly pace that I think is truly minimal for a good blog, but I’ll do the best I can. Today I want to touch on what is probably the hottest topic in psychiatry: whether psychologists should obtain prescription privileges. This is topical because Oregon just overwhelmingly passed a law authorizing prescriptive privileges for psychologists, although it is unclear whether the governor will sign the bill. I endorse psychologists prescribing, and here’s why: it would be the single best thing that could happen to psychiatry. Yes, I know it sounds ridiculous, but here’s my reasoning. Psychiatry has boxed itself into a tiny corner of medicine called “psychopharmacology.” It’s a silly way to practice our craft, because the essence of what we do is to understand the mind and to help people live better lives. 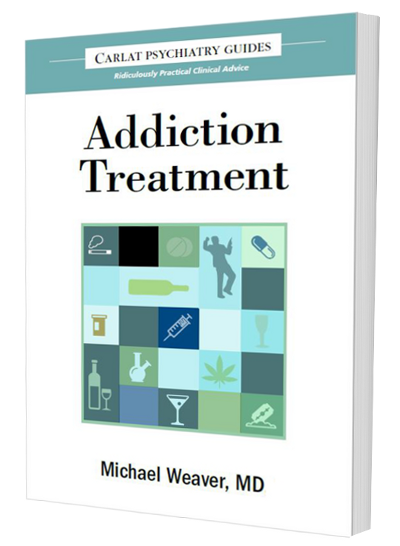 Drugs are effective but only one of the tools available to us, and we have largely ceded psychotherapy to psychologists and social workers. The result is a fragmentation of care. You see your “p-doc” for your meds, and you see your therapist for your mind. Each professional is far too busy to communicate with the other. While there are plenty of patients out there who do so well on meds that they don’t need therapy, the majority of patients do best with both meds and therapy. But psychiatrists rarely provide the full package of treatment, because we are trapped in a system of incentives that discourage integrative care. Insurance companies pay more for med visits. Drug companies throw the full force of their marketing machinery into pushing medications. The top psychiatrists find that the road to academic glory lies in psychopharm research. And our anachronistic training system, which requires that psychiatrists attend medical school, selects for practitioners who see people in terms of discrete diagnoses, and who are rarely psychologically minded. Enter psychologist prescribers. These are professionals who went into their field because they are fascinated by the human mind. From early in their training, they learn about psychiatric diagnosis, psychological testing, psychotherapy, interpreting behavioral science research, neuropsychology, etc…. They don’t go to medical school, so they learn nothing about such crucial psychiatric topics (being sarcastic here) as gross anatomy, histology, pathology, or the physical exam, nor do they have clinical rotations that psychiatrists draw upon daily, such as Ob/Gyn, surgery, internal medicine, radiology, and others. Thus, psychologists don’t learn how to deliver a baby or how to tie a surgical knot, but they do learn how to get at the root of anxiety and how to keep patients coming back for treatment. As the safety data gradually accrues, I predict that psychologists will attain prescriptive privileges in most states over the next 10 to 20 years. We saw the same pattern in the 1970s with nurse practitioners—psychiatrists and other physicians engaged in bitter turf wars initially, arguing that they didn’t have enough training, but large scale health services research studies eventually demonstrated that NPs operated competently and safely, and now they are accepted as independent practitioners in most states. As it turned out, there is so much business to go around that psychiatric nurse clinicians have not eaten into psychiatrist’s practices or incomes. On the contrary, since NP’s must receive regular supervision, many psychiatrists have developed side gigs supervising nurses, charging $200 to $300/hour—more than you can make seeing patients. According to some psychologists I have spoken with, the early experience in New Mexico and Louisiana is that psychiatrists and medical psychologists (that’s what they are termed in Louisiana) are accommodating to one another and that psychiatrists are not losing business. 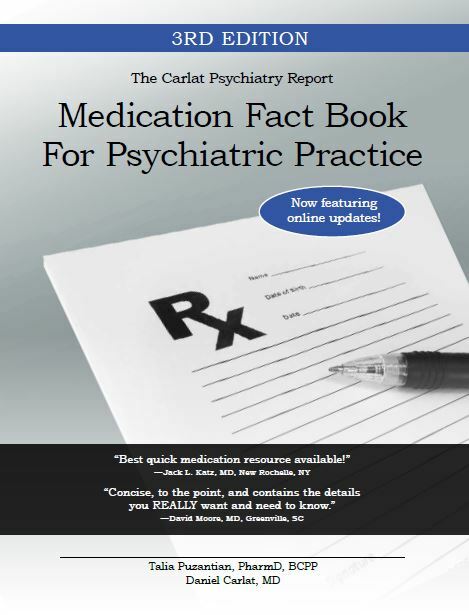 But as more and more states approve prescribing psychologists, this will probably change. I predict that patients will vote with their feet and preferentially see prescribing psychologists once they realize that such practitioners provide one-stop shopping—meds and therapy combined. And herein lies the great opportunity for psychiatry. As psychologists gradually become serious competitors for our patients, we will have to re-evaluate how we practice and how we are trained. We will have to take a close look at our catastrophically inefficient medical school-based curriculum. We will have to decide which medical courses are truly necessary and which are not. I suggest that the process begin with a work group created jointly by the American Psychiatric Association and the American Psychological Association. Yes, let’s get psychiatrists and psychologists in the same room, and create an ideal curriculum for integrative psychiatric practitioners. Let’s face it, going to 5 to 7 years of psychology graduate school, then capping it with 2 years of psychopharmacology is not an efficient use of training resources. It’s almost as inefficient as going to four years of medical school, one year of medical internship, then three years of psych residency. There must be a middle path—perhaps a five year program that would interweave coursework in physiology, pharmacology, and psychology from day one. The specifics would require much thought and discussion, and would best be done by reverse engineering. Start with the ideal psychiatric practitioner, list the core competencies such a person requires, and then figure out the very best way to teach those competencies. On the other hand, organized psychiatry can continue on its current path, which involves throwing millions of dollars into lobbying efforts to fight psychologists. The money is being wasted, I can guarantee that. At the end of the day, we will be on the sidelines as patients flock to prescribing psychologists and our professional sphere constricts further and further into a narrowly defined neuropsychiatry role. We can do much, much better than that.